It is our great pleasure to announce the ninth Ute Bock Cup. 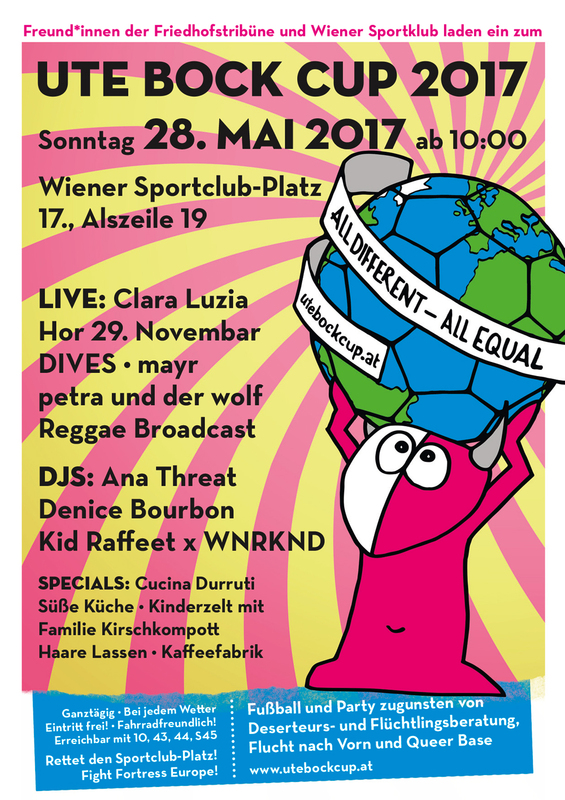 This year the fun and games start on the 28th of May at 10:00 at the Wiener-Sportclub-Platz. Solidarity and interculturalism are the central aims of this amateur football tournament. As always, a large and diverse side program will support the main event. Our goals haven’t changed over the years. Besides the fun of playing and watching the ‚beautiful game‘, we want to set an example against discrimination, racism and exclusion, both on and around the pitch and in daily life. We also want to collect as much money as possible in order to help refugees. 100% of the net profits from the event will go to organisations which support refugees with uncomplicated, unconditional and independent commitment. The Ute Bock Cup is organised and run by volunteers. Last year, more than 150 people helped to make the event such a great success. For us, the ‘Freund*innen der Friedhofstribüne’ and Wiener Sportklub, as the organizers of the cup, it’s really important to act in the essence and spirit of Ute Bock herself. This year, 32 teams will be competing for the three trophies: the All Gender (AG) Cup, the Female Inter Trans (FIT) Cup and the Fairplay Cup. For all you music lovers, this year’s live acts are: Clara Luzia, Reggae Broadcast, The Dives, Mayr, Petra und der Wolf and the choir Hor 29. Novembar. Ana Threat, Denice Bourbon and Kid Raffeet vs WNRKND will be spinning the tunes. The Cucina Durruti will be cooking up tasty vegetarian food and the ‚Süße Küche‘ will be catering for those of you with a sweet tooth. The ‚Familie Kirschkompott‘ is looking forward to entertaining all our little guests in the children’s corner. We provide asylum seekers and ‘illegal’ people with self-organized, uncomplicated and unconditional advice. We do this independently and free of charge on an individual or comprehensive basis. We are dependent on donations to continue this kind of work and we are always grateful for financial support. ‘Flucht nach Vorn’ was founded in 2014. The organisation provides children and young people from a migration background, access to leisure activities in the sectors of sport, art, education, music and performance. We also aim to nurture their talents. The result of this is that new networks and connections develop within Austrian society, creating feelings of settlement, stability and appreciation within the youngsters. They become empowered and their self-esteem is strengthened, as is their motivation to integrate peacefully and respectfully. Queer Base – Welcome and Support for LGBTIQ Refugees, is an organization run by people in Vienna with or without a migration background, who want to improve the situation for Lesbian, Gay, Bisexual, Transgender, Intersex and Questioning (LGBTIQ) people who have fled to Austria. Our support includes helping with the asylum process, networking within the community, organising social events and providing advice in legal matters.